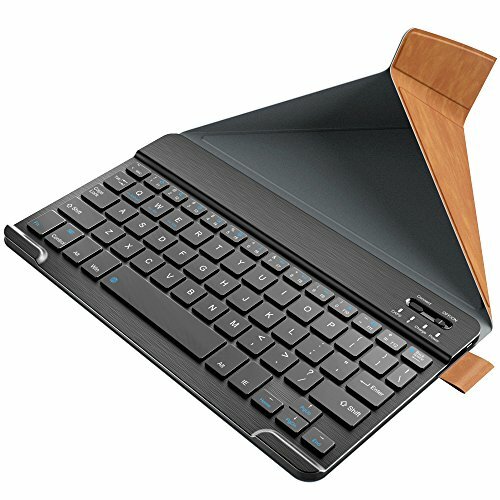 Nulaxy KM12 Bluetooth Keyboard Business Portable Rechargeable Compatible with Apple iPad iPhone Samsung Tablets Phones W Keyboard Cover - Brown by Nulaxy at FloType. MPN: KM12. Hurry! Limited time offer. Offer valid only while supplies last. 1.【CROSS COMPATIBILITY】Compatible with iOS, Android and Windows, including iPad Air 3/2/1, iPad Pro, iPad Mini 4/3/2/1, iPad 4/3/ 2, iPhone X/8/8 Plus, surface tablet, smart phones and etc. 2.【ULTRA SLIM AND PORTABLE】The thin and compact design makes Nulaxy wireless keyboard easy to carry with your backpack, best choice for travelling or business trip. 3.【COMFORTABLE KEYS】Type quietly and effortlessly. KM12 full size universal keyboard provides a very comfortable and wonderful typing experience. 4.【ENERGY SAVING】Automatically goes to sleep if 15 minutes without typing. Last over 60 days (based on two hours use per day) with power-saving mode. 5.【INCLUDING A COVER】The decent leather cover offers perfect protection for your portable business keyboard. It can also be folded and used as a smart stand for your iPad, tablet and smart phone. If you have any questions about this product by Nulaxy, contact us by completing and submitting the form below. If you are looking for a specif part number, please include it with your message.